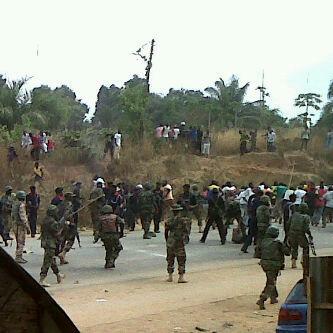 We have received reports of pandemonium, breaking out at the Nasarawa State University in Keffi. Authoritative sources confirmed that soldiers had stormed the school gate to disrupt the rampaging students, who were protesting the scarcity of water in and around the institution. Although the school has hostels on its campus, majority of the students live off campus. Speaking, an Accounting student said the students had blocked the main road in front of the school gate. This he said disrupted traffic for several hours. The road is a major link road connecting Benue and Lafia to Abuja. Our source narrated that the soldiers in a bid to disperse the students to allow free flow of traffic, fired live bullets. He said three students may have died as they were hit in critical parts of their bodies. Presently, about a dozen students have been rushed to the hospital and some are in critical condition. As at the time of this report, the students have razed down a police station opposite the Angwan Lambu community. God we dey ur hand o!